The Nigerian Security and Civil Defence Corps (NSCDC) in Borno State has recovered food items and books donated to malnourished children which were stolen by some persons. The items were retrieved from the unauthorised persons while trying to transport them from Borno State to the eastern region of the country. According to the state commandant of the NSCDC, Ibrahim Abdullahi told journalists on Monday that the items were seized at the Borno express bus terminal following a tip-off. 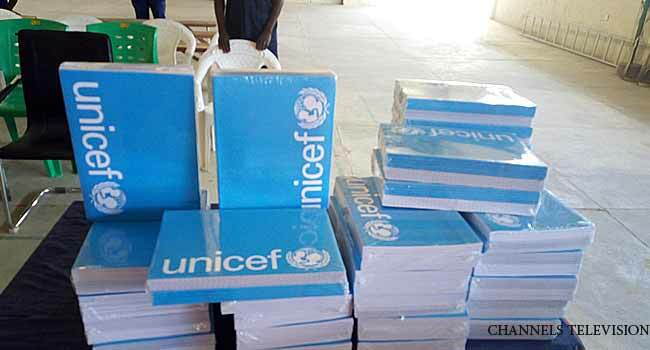 The books were freely donated by United Nations Children’s Fund (UNICEF) while the food supplements were donated to victims by the World Food Programme. Early outcome of investigations by the NSCDC indicates that the books were stolen from the bookstore for repackaging and resale at wholesale prices. “They normally carry these books to the eastern part of the country where they will just change the cover and sell at exorbitant prices. “We were able to recover these cartons at Borno Express Park today. We are going to hand over the books to Yerwa Girls secondary school. Since they are meant for the children of Borno state,” he said. The culprits behind the theft of the books have since been arrested and are currently in the custody of the NSCDC. While the food supplements were recovered the perpetrators, however, escaped.